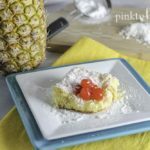 A delicious summer version of pineapple upside down cake that meets a cake mix cookie bar. Heat the oven to 350 degrees. In a medium bowl, add the cake mix, oil, milk, eggs, and mix well. Pour the cake mixture into a 9 x 13 glass cake pan. You can also use a square 8 x 8 for thicker bars. Place the pineapple rings on top and then push them into the mixture. Add 3 cherries inside each pineapple ring. Bake in the oven for 22-25 minutes, or until a toothpick comes out clean. Allow it to cool completely. Add 3 additional cherries to each slice and then sprinkle with shredded coconut and powdered sugar before serving. Enjoy!